The fountains of Charlottetown. An Artist’s Review. Charlottetown is one of those nice small towns that really causes it citizens to stop, pause, and think WTF. We don’t have many examples of public art or monuments, but we do have what can only be described as one of the world’s great motley collections of just plain strange and crazy water fountains. This is a new water feature at the Confederation Centre of the Arts, and I actually like this one. When they were renovating the building they converted a set of stairs into a waterfall. It would have been more impressive if it was on a larger scale and looked less like a water main had broken, but small children like it, and I imagine that late at night after the bars close young men pee in it. 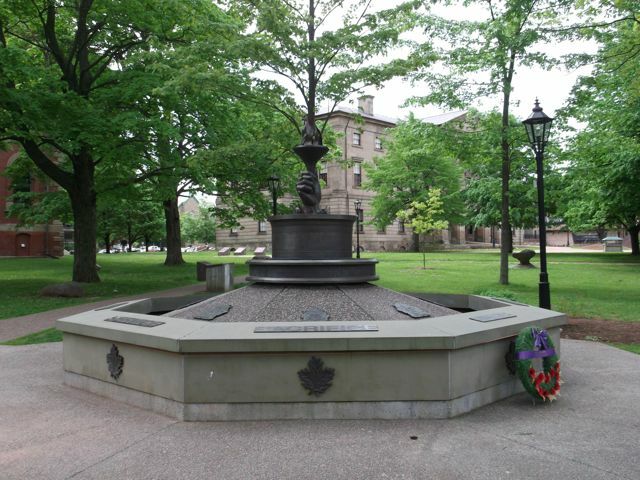 The fountain in front of Province House is a great example of Charlottetown’s fountains. In the summer it may seem like a nice little fountain but upon closer inspection it really is just an under-scale circular concrete basin with a jet of water that shoots an impressive three feet in the air. I think my garden hose could do better. 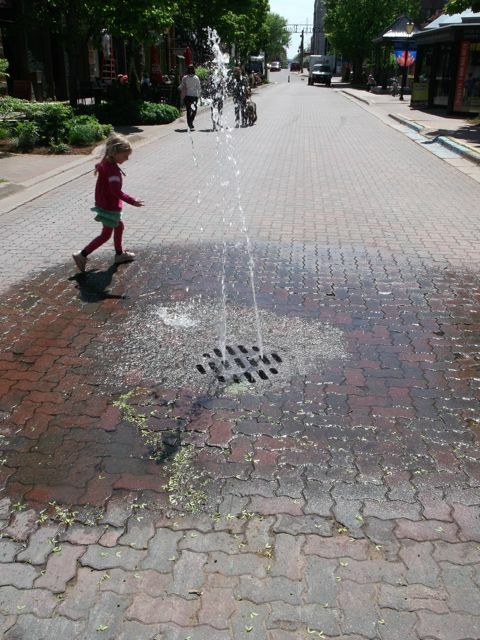 Yes, this is an actual fountain and not a sewer line backing up. 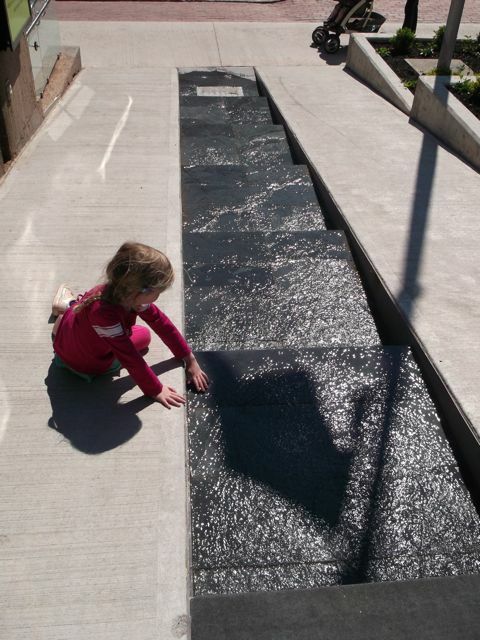 Each summer Charlottetown closes off a section of Richmond Street to use as a pedestrian mall, and then they turn a storm drain into a fountain. They must attach a hose to a section of the water main, and it shoots a couple of jets of water into the air. As you can see, children love to run around it in ever decreasing circles until they run through it. When people come across it for the first time they often stop dead in their tracks and stare dumbfounded upon its glory. 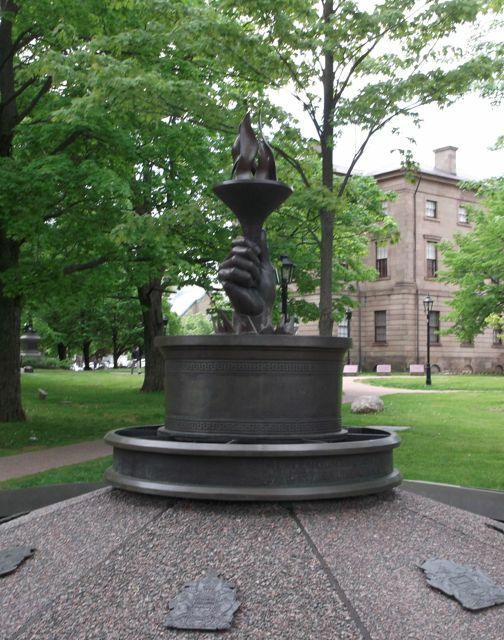 I have to admit that I love this fountain, and it’s one of those strange things I like about Charlottetown. Whoever thought of doing this was some kind of crazy, and I’m glad they did it. I have saved this one for last. 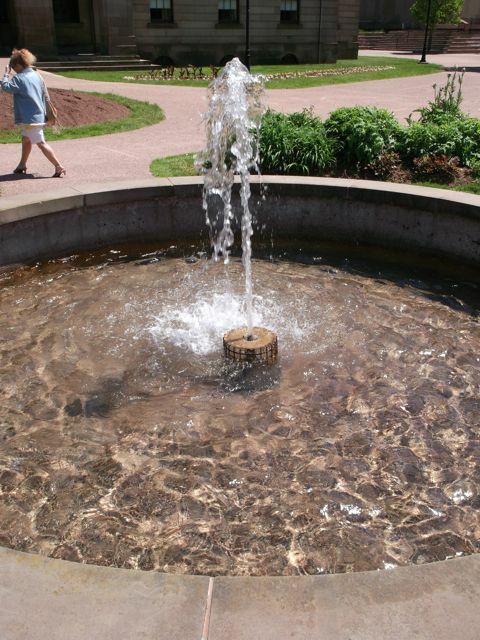 It looks like someone wanted to create a beautiful and impressive fountain for Charlottetown. Unfortunately, they seem to have built it with off-the-shelf or leftover parts, none of which were in proportion to one another. The hand with the torch popping out of what appears to be a cake really confuses me, and wouldn’t it have been better to include some of the forearm? The base is too wide for such a squat structure, and the bronze cake with the flaming hand seems to have been dropped on top as an afterthought. I’ve noticed that the water element seems to be broken at the moment, but when the water is on it does look better due to the reflection of light on the water’s surface. Though this is the most formal attempt at a fountain in Charlottetown it is in my opinion the least successful. Maybe on paper it looked better, and I wonder if they bothered to build a scale model before building it? This entry was posted in Reviews of books and things. and tagged artists reviews, Charlottetown, Confederation Centre of the Arts, fountain reviews, fountains, Prince Edward Island, Richmond Street, Tourism Charlottetown, Tourism Prince Edward Island. Bookmark the permalink. 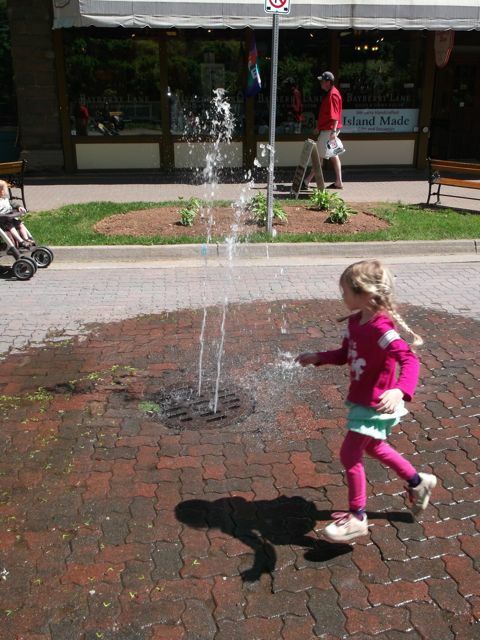 The Storm Drain fountain is my favorite too Stephen! Dogs like to get drink there when it’s hot. Kids ride their bikes through it. One tourist asked me if we should be calling the city about the leak! You’re missing a fountain. The one tucked behind the Shaw building. It’s prolly the most impressive ‘fountain’ wise…. The Shaw fountain is one that I loved when I was a kid. At night it was lit up, and easily visible from the street. Now it is forgotten and in need of restoration, and the city or province would be wise to bring it back to it’s original state. I plan on doing a post about it. I really liked your fountain post. Thanks for showing the pictures. I’m going to go back and read some of your previous posts as I have time. and follow you on my blogger account.